How do you value a film that never made a dime for the production studio and investors? The California Court of Appeal, which recently looked at this issue in a bankruptcy-related case, did not exactly come up with the answer, but the court was clear on what valuation approach did not work. Over 10 years ago, Reliant Pictures set up a production company that made and wholly owned the contested film. Most of the money for the film, which cost about $4.2 million to make, came from third-party investors. Just before declaring bankruptcy, Reliant transferred the rights to the production company and the film to the investor group. Reliant’s ownership interest in the film became a point of contention. In early 2010, the plaintiff bought Reliant’s ownership interest in the film at a bankruptcy auction for $140,000. He then sued the investors and Reliant board members, claiming they had engaged in a fraudulent transfer. A two-phase trial followed in which the plaintiff’s media and entertainment industry expert stated the value of an independent film was “a percentage of the cost of making it” and proposed this particular film was worth $2.73 million. The jury awarded the plaintiff $3 million. ‘Illogical’ expert testimony: The trial court dismissed the expert testimony as “illogical” and rejected the jury verdict as unsupported by the record. The court sidestepped the valuation issue by prescribing a different remedy: requiring the investor defendants to return the film to the plaintiff in the condition in which it was in on the date of transfer, 2009. The state Court of Appeal, in turn, called the trial court’s remedy “unworkable and inequitable.” After the transfer, the investor owners had re-edited film; undoing the later changes was problematic. Also, the appeals court said, the plaintiff would not get the value of the film “if only because the film’s timeliness has faded.” However, the appeals court agreed that the plaintiff expert’s “attempt to assess the film’s future income as a factor of its production costs was pure speculation.” This calculation contradicted “the inescapable fact that the film generated no income in the two years since its completion, despite extensive marketing.” The Court of Appeal went on to say that a “film, as art, is particularly unsuitable to the market data method.” Since none of the other witness statements represented reliable evidence of the film’s value, the appeals court sent the case back to the trial court, ordering it to determine the value of the interest Reliant Pictures had in the fraudulently transferred assets, including the film as it was in 2009. The case is Holder v. Howe, 2016 Cal. App. Unpub. LEXIS 8989 (Dec. 14, 2016). A digest and the court’s opinion is available at BVLaw. BNA Bloomberg provides a good overview of what’s on the horizon in terms of tax and accounting changes in a white paper. It includes insight into the potential implications of the revamped tax code that President-elect Donald Trump and House Republicans have promised to make a top priority in the first 100 days of the new administration. The report also examines the state tax front, including the campaign that is growing to do away with the U.S. Supreme Court’s 1992 standard for when states can impose sales and use taxes. The closely watched expected accounting standard on credit losses is also examined, which could affect banks and their bottom line. Sec. 2704: The report also says that the pervasive thought on Capitol Hill and among trade groups is that the controversial proposed estate tax rules on valuation discounts could get pulled when Trump takes office, but it is unclear whether they will disappear for good. The successful rocket launch last week by Elon Musk’s SpaceX brings up some interesting valuation questions about a fledgling and high-risk business. The launch was the first since the company’s last attempt resulted in its rocket blowing up on the launching pad. Fleming tells Michael Blake (Arpeggio Advisors), who has done appraisals of space commercialization companies, that Musk and his firm “will continue to accomplish remarkable things, but by no means is that an attainable model as yet.” However, there is optimism that this industry will eventually make a lot of money. Fleming points out that the more successful firms will target a particular market need and not try to be all things to all people. Alternative space firms are involved in launch services, hauling cargo to space stations, satellite and rocket manufacturing, recovery of minerals on asteroids, as well as space tourism for the superwealthy. So far, the need for valuation typically has been in a 409a context (lots of stock options are being issued), the raising of capital, and gifts or transfers. Blake interviewed Fleming on his insights into this industry, and you can read it in the February issue of Business Valuation Update. During BVR’s first keynote-style webinar, Douglas Hubbard (Hubbard Decision Research) discussed how to measure intangible aspects of a business that you may have previously considered immeasurable, such as customer satisfaction, organizational flexibility, technology ROI, and technology risk. Hubbard is the creator of Applied Information Economics, and he offers some free example spreadsheets on his website. Take a survey: Hubbard also asks for some help with a survey he’s conducting about difficult measurement challenges. If you’d like to participate, please click here. Amassing a minimum of 3,000 hours of fair value measurement experience. Experience must be attested to by a supervisor (or past supervisor if you changed employers). If a partner/supervisor is not available, peer attestation is acceptable. There are no exceptions to experience attestation. Passing a qualifying valuation exam. You must pass any of the following: Accredited in Business Valuation (ABV) exam, AICPA Valuation Principals exam, Accredited Senior Appraiser (ASA) BV 201-204 exams or challenge exam, Royal Institute of Chartered Surveyors (RICS) oral assessment, Chartered Financial Analyst (CFA) level III, or Chartered Business Valuator (CBV). Completing a rigorous fair value measurement curriculum. The AICPA has created an education program that can be purchased on its own or in a bundle along with the exam and additional courses, allowing you to individualize the program to your needs depending upon your pathway to the credential. Passing a two-part CEIV exam. The two-part CEIV examination is slated to launch early this year. You may complete this web-based exam on your personal computer and at your convenience. Becoming an AICPA member. If you’re not already a member, apply today. To maintain the credential, CEIV designees must satisfy ongoing experience and education requirements, follow a performance framework, and participate in an annual, proactive quality monitoring program to provide confidence to markets and regulators that they are performing high-quality valuations in compliance with the newly developed performance requirements. Learn more! Goodwill impairments increased in 2015 for companies in the STOXX Europe 600 Index, according to the 2016 European Goodwill Impairment Study from Duff & Phelps. Goodwill impairments increased by 26%, from €29.4 billion in 2014 to €37.1 billion in 2015. From an industry viewpoint, financials had the highest aggregate goodwill impairment, at €14.3 billion. From a country perspective, Germany had the highest aggregate amount of goodwill impairments, at €11.6 billion. The STOXX Europe 600 Index is comprised of large, mid- and small-capitalization companies across 18 countries of the European region. How do marketing intangibles drive the value of medical device businesses? This is a question addressed in this month’s industry sector snapshot from MARKABLES. An important aspect about the medical device sector is that it is quite heterogeneous. For example, there are durable technical devices, which are used many times on different patients, or there are single-use devices and consumables, which need to be replenished every week. By the same token, there are long-lasting devices, which are used on one individual patient only, such as implants. It is obvious that purchase behavior, purchase decision, and brand preference are fundamentally different. To account for this, the analysis looks deeper into three different subsectors: measurement and monitoring equipment, orthopedic implants, and single-use devices and consumables. All in all, the peer group in these three subsectors consists of 83 businesses in 17 countries that were acquired between 2004 and 2015. The table below illustrates the median ratios for various valuation parameters by the three subsectors. Surprisingly, enterprise values differ largely in the three subsectors. Implant businesses are valued at 4x revenues, consumable and single-use businesses at 2.5x revenues, and measurement businesses at 1.6x revenues only. There is impressive evidence for the profit split theory of intangible assets, whereby a royalty rate paid for an intangible asset is a result of splitting the profit between licensor and licensee. 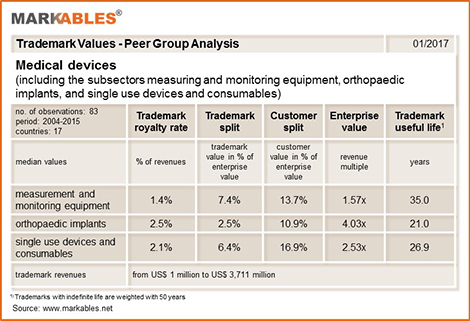 Accordingly, average trademark royalty rates on revenues are highest for the most profitable businesses (implants) and lowest for the least profitable (measurement). Similarly, the average useful lives of trademarks show the same differences. 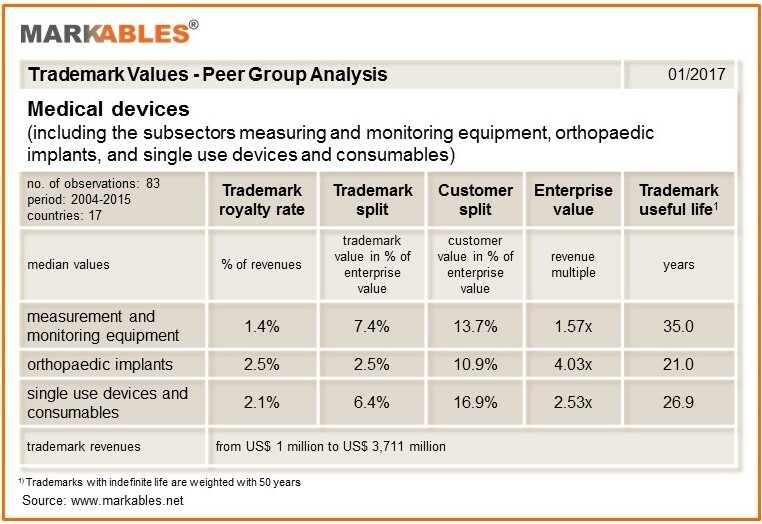 Moreover, in single-use and consumables—which is the lowest tech of our three subsectors—the total of trademark plus customer value is highest, although, with 23.3% of enterprise value, it is still relatively low. Other intangibles (i.e., technology) as well as the value of the skills to cope with future challenges (innovation, organizational improvements, new market strategies) have their shares as well. This analysis illustrates the importance of a thorough composition of homogenous peer groups at the product/sector level. “How ESOP Trustees Size Up a Potential Valuation Analyst” (BVR Editor). An ESOP trustee explains how a valuation analyst is selected for an engagement and provides some comments on a 43-point checklist of questions and information requests the appraiser will face. “Business Valuation Year in Review 2016” (BVR Editor). The year 2016 was an eventful year for the business valuation profession, both from a U.S. and global perspective. Here is a wrap-up of some of the more notable developments, some of which set the stage for 2017 and beyond. “A Case Study of Valuing Distressed Assets in the Energy Sector” (Doug Peterson, Valuation Research Corp.). The precipitous drop in oil prices in 2015 affected the valuation of an energy and production company in Chapter 11 bankruptcy protection. “An Investor’s View of the Valuation of Alternative Space Firms.” Michael Blake (Arpeggio Advisors), an appraiser of space commercialization companies and investment funds, interviews Stephen Fleming (Boostphase), who is an investor in six private aerospace companies. “NYSSCPA Symposium Highlights Valuation and Other Challenges of the Legal Marijuana Industry” (BVR Editor). BVU attended the Marijuana Symposium: Business, Tax and Legal Implications, sponsored by the New York State Society of CPAs. New York state senators, a marijuana firm operator, attorneys, accountants, and valuation experts gave some interesting insights. “AICPA BV Chair Nathan DiNatale Discusses the New CEIV Credential.” The mandatory performance framework (MPF) has just been finalized for the new valuation credential related to fair value for financial reporting that has been developed under a joint effort of the AICPA, ASA, and RICS. BVU interviewed Nathan DiNatale (SC&H Group), chair of the AICPA Business Valuation Committee, about the new credential. “IACVA Readies Exposure Draft for Peer Review of Valuation Services.” William Hanlin, president of IACVA, discusses the need to enhance the professional standards of valuation worldwide and give valuation professionals more control over the practices within their own field. IACVA is working on a final version of an exposure draft on how peer review can work within the valuation industry. To stay current on business valuation, see the February issue of Business Valuation Update. A surge in law firm M&A along with the impending mass retirement of baby-boomer attorneys who own law firms means a wealth of opportunities for business appraisers and consultants. So check out the latest in the series of What It’s Worth valuation guides: What It's Worth: Law Firm Value. It will help you understand the key considerations to take into account when valuing a law firm including goodwill, origination credits, billing, and productivity. Plus, it provides key industry trends and data to help benchmark the value of a law firm. For details and a Table of Contents, click here. People: Kristi Reale has been admitted as senior manager at Meyers Brothers Kalicka of Holyoke, Mass. Firms: New York City-based Grassi & Co. has merged in James Bohl, CPA, PC, of Ronkonkoma, N.Y., which will now be known as Grassi Franchise Services LLC … Louis T. Roth & Co. has added Eiche, Smith & Co. PLLC, whose partners and staff have joined Roth’s Louisville, Ky., offices. FREE WEBINAR: Marijuana: Value Drivers and Valuation Issues to Know in 2017 (January 18), with Ed Keating (Cannabiz Media) and Jim Marty (Jim Marty and Associates LLC). Valuation of Small and Medium Sized Software Companies (January 19), with Hans Schroeder and Greg Carpenter. The Double Dipping Debate (January 25), with Donald DeGrazia (Gold Gerstein Group), Robert Levis (Levis Consulting), and Kim Willoughby. Valuation of Investment Advisory Firms (January 26), with Warren Burkholder. Part 1 of BVR's Special Series on Banking and Financial Services.